An early question when planning the SirMixABot robotic bartender was how to control the device. Ultimately, we planned an Arduino project for a number of reasons. Similar to SirMixABot’s overall design, and Arduino was chosen for its durability and affordability. Below we’ll analyze its unique characteristics, and how they compliment the ultimate automated bar. Like many components of the cocktail machine, the electronics need to be affordable. Any quick online search will reveal that Arduino projects are extremely numerous in a variety of applications. Everyone from tinkerers to large scale corporations utilize these micro-controllers. One of the primary reasons for this popularity is the price point. Even in small batches and one-off purchases an Arduino board (in kit form or assembled) is typically under $50, often times much less. 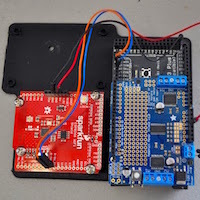 SirMixABot utilizes an Arduino Mega 2560. Like other products, it’s offered by a ton of vendors, with great availability, and at competitive pricing. Perhaps the most appealing aspect of an Arduino project is the ability to customize. From a software perspective, there are no limitations that come with many microcontroller competitors. 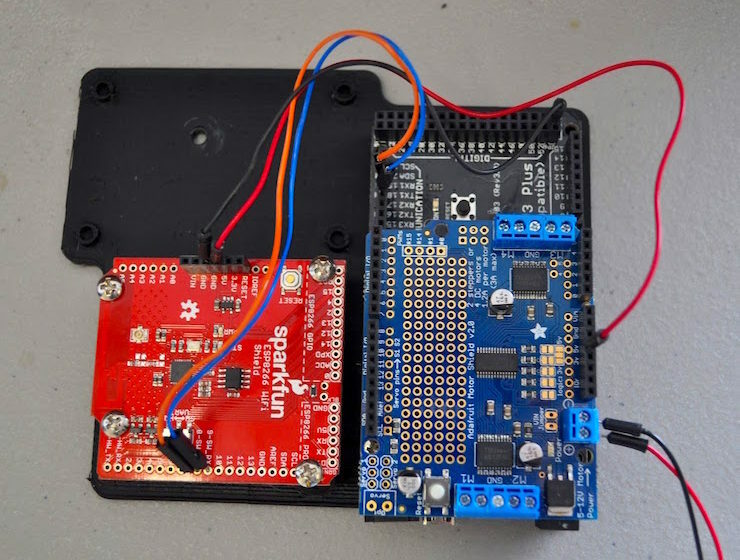 The Arduino software runs on Windows, OSX and Linus, so out of the gates it is approachable by all users. For beginners, stepping into the programming is simple, and straightforward. For experts, it comes without constraints, allowing creativity and skill to shine through. Both the software and modular hardware are open source. 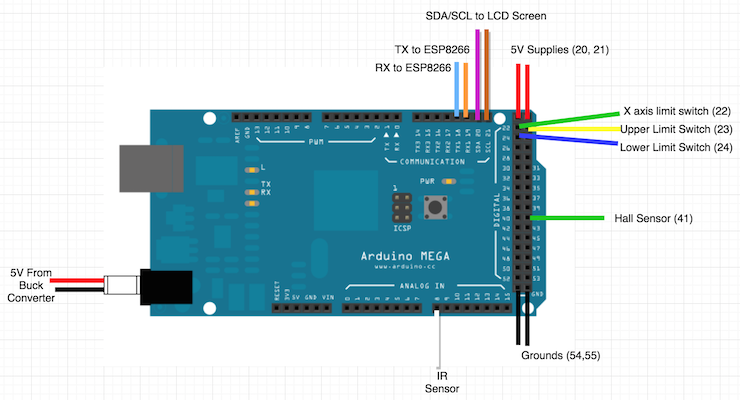 With Arduino you can do everything from adding your own code, to designing your own circuit board – truly a tinkerer’s dream. There are a lot moving parts in SirMixABot. In addition to keeping the microcontroller simple from a software perspective, the hardware needed to be match those criteria. With the Arduino Mega 2560 board, size is not an issue. The WiFi module, motor shield, and Arduino board all fit on one custom 3D printed piece. Even stacked, they comfortable fit in the small gap under SirMixABot’s laser cut base. Power cables run cleanly through a notch one the side panel. Wiring for the stepper motors, limit switches, infrared sensor, and hall sensor all run up to the drag chain. We went with an Arduino project for our needs because it fits current and future versions of the robot bartender. Finally, reliability is key. When you have over 1,000 available cocktails at your disposal, you need to be able to depend on your microcontroller. As with the other hardware, repetition and longevity are the name of the game. 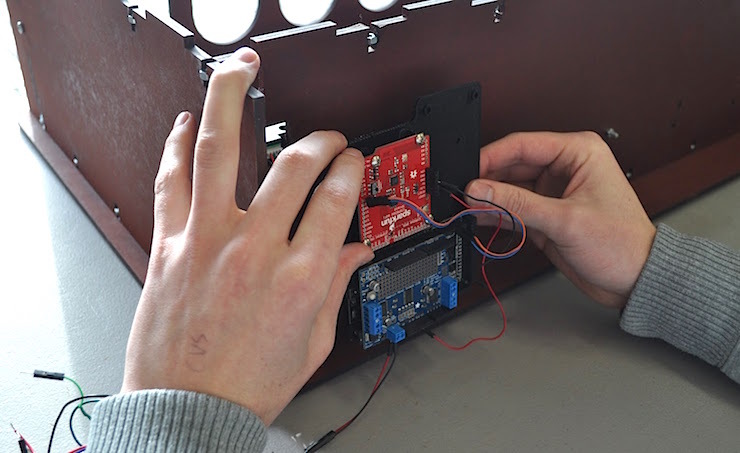 The Arduino Mega 2560 board will not deteriorate over time, and connections are tried and tested. A robotic bartender is an amazing party attraction, and nothing feels worse than having it stall or disconnect mid-performance. With an Arduino that is not the case. Tell your friends to grab their glasses, because SirMixABot will pour all night long with this setup!